The Alum Cave Bluffs Trail is one of the most beautiful and easily accessible trails for day hikers, as well as, overnight hikers. The trail leaves the Newfound Gap Road (U.S. Highway No. 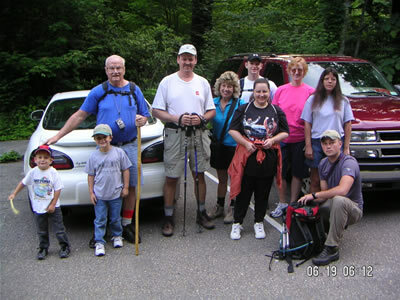 441) at the Alum Cave Bluffs parking area, approximately nine miles south of the Sugarlands Visitor Center or four miles north of Newfound Gap. The Alum Cave Bluffs Trail is one of the most heavily used trail in the park by day hikers and is widely acknowledged by overnight hikers as the best route to the lodge at the top of Mt. LeConte (Hickler, 1976: 1). The trailhead for the Alum Cave Bluffs Trail, is at the junction of Alum Cave Creek and Walker Camp Prong. Five major trails lead to the top of Mt. 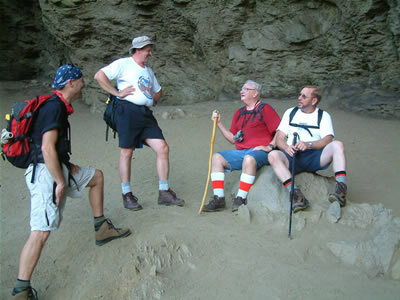 LeConte of which Alum Cave Bluffs is the shortest (5.2 miles). Any spot along this pathway may serve as an objective point-truly a trail to follow without thought of where it leads. For this reason, the Alum Cave Bluffs has been called the trail with the continuity of thrills (Thornburgh, 1942: 127). 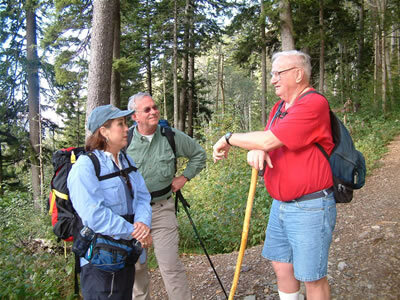 This trail contains a multitude of attractions to offer the casual day hiker and more serious backpacker. Definite points of interest enhance the beauty and variety of this route (Marsh, 1973: 92). 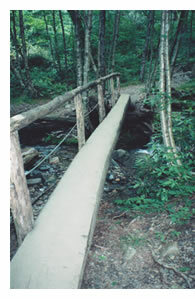 After initially crossing Walker Camp Prong, the trail crosses and re-crosses Alum Cave Creek for the first 0.75 miles. At that point the trail parallels the Styx Branch, for more than another half mile. Hikers, walking down to Alum Cave Creek or Styx Branch, which parallel the trail, during the first mile, have created numerous side paths leading down the stream’s bank to deep pools of water and waterfalls. Water runoff, flowing down these steep side paths, have resulted in erosion. 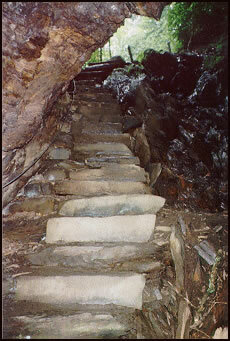 Forty-four of these paths were measured and recorded during the course of this study. time. 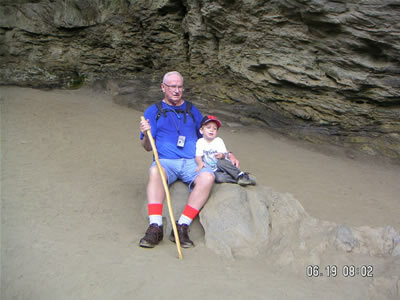 The hiker then starts the steep ascent out of the valley to the Alum Cave Bluffs. At 2.0 miles, the footpath passes Inspiration Point, a fine overlook in a large heath bald or laurel slick. The heath bald is composed of laurel (Lauraceae), sand myrtle (Leiophydlum buxifolium), and blueberry bushes (Ericaceae). Red spruce (Picea rubens) and balsam fir (Abies balsamea) are the predominant forest types beyond this point. From Inspiration Point, the hiker is afforded a spectacular view of Peregrine Peak (Eagle Nest Crag). This is a true knife-edge ridge–one of the few found in the Great Smokies (Adams, 1966: 27). Peregrine Peak is underlain by the Anakeesta Formation, composed mostly of pyrite slate (Murlless and Stallings, 1974: 252). Anakeesta is derived from the Cherokee language meaning place of the balsam (Fink, 1956: 13). Theeastern side of this high, narrow ridge is concave in shape, while the western slopes exhibit a very sheer vertical angle. The ridge is nearly treeless. However, a thick mat of rhododendron (Rhododendron catawbiense), fetterbush (Lyonia lucida), sand myrtle, and other plants grow from within cracks in the rocks. By looking west from Inspiration Point, two weathered openings may be viewed on the black slate face of the peak. The irregular shaped holes are small, not more than three or three and a half feet in diameter (Adams, 1966: 28). On May 31, 1925, Paul J. Adams, a noted traveler in the Smokies and Albert F. Ganier, an ornithologist, observed and examined a duck hawk’s aerie located on a short ledge comprising Peregrine Peak. At 2.3 miles, and 4900 feet elevation, the trail passes under Alum Cave Bluffs–an overhanging cliff composed of black Anakeesta slate. Many hikers turn back at this point. For the individual who goes on, the views become more rugged as the trail ascends. The trail width narrows above Alum Cave Bluffs from six feet to four feet. Excessive use of the trail, below the Bluffs, by dayhikers has resulted in this widening. A short distance up from Alum Cave Bluffs (0.2 miles), to the left, a small rocky overlook affords magnificent views of the deep valley of Trout Branch and the south face of Mt. LeConte. Also visible from this point are exposed rocky scars–the result of a series of debris slides associated with the Labor Day, 1951, cloudburst. The trail crosses one of these scars twice near a sharp switchback. Huggins Hell is located 0.5 miles further up the footpath from the Bluffs. This area is characteristically a wild, deep trackless gorge filled with laurel, some red spruce and balsam fir, and numerous shrubs. The name Huggins Hell as applied on this trail, comes from an area of the same name located in the Hazel Creek section of North Carolina. 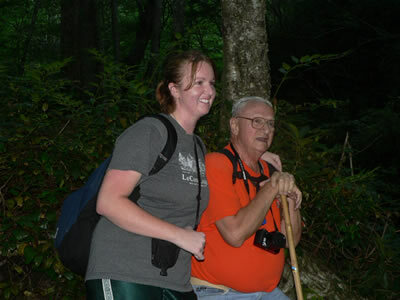 Legend has it that Irving Huggins, a herdsman, tried to cross a 500-acre field of laurel thicket on top of Silers Bald to reach another ridge. Somehow, during the journey through the thicket, Huggins lost his sense of direction. By following the stream, within the maze of laurel, he stumbled out of the field near death one week later (Thornburgh, 1942: 91). At 5.0 miles, the trail turns east around the flank of Cliff Top and soon joins the Bullhead and Rainbow Falls Trails (Murlless and Stallings, 1974: 236). This junction marks the end of the Alum Cave Bluffs Trail. The LeConte shelter is located 0.2 miles straight ahead on the Boulevard Trail. Mt. LeConte is the third highest peak in the park at 6,593 feet above sea level. Many people contend that LeConte is the tallest peak east of the Rocky Mountains. This mountain towers higher above its immediate base than does any other peak in the Smokies. The 5,301-feet difference between Gatlinburg’s 1,292 and LeConte’s 6,593 feet makes Mt. 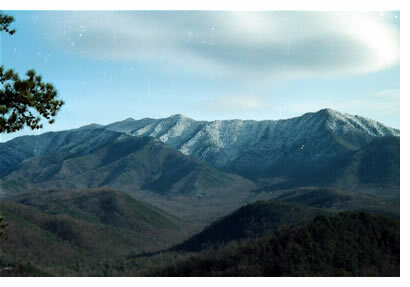 LeConte the tallest–highest above its immediate base–in the eastern United States (Campbell, 1969: 26). This makes Mt. LeConte one mile and 21 feet tall, 59 feet lower than Clingmans Dome (6,642 feet), and 28 feet lower than Mt. Guyot (6,621 feet). 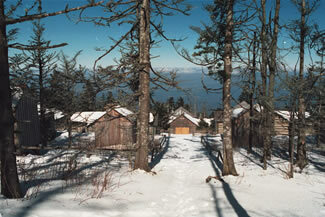 LeConte Lodge, located at the top of the mountain, is the highest resort east of the Mississippi River. Maintained under a lease agreement with the National Park Service, the LeConte Lodge furnishes eight balsam log cabins which accommodate a total of 50 individuals. This lodge has been called the smallest hotel in the world (Bowman, 1948: 108). Paul J. Adams was the first man to operate the guest facility, on July 13, 1925, under contract with the Great Smoky Mountains Conservation Society. 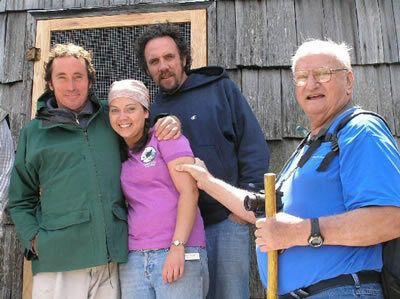 From its beginning as a large tent, the facility has expanded to the present cabins and a large dining room which also houses the resort’s operators. In a recent six and one-half month season, the lodge accommodated 6,800 overnight guests, although the average rate is usually 4,000 annually (Marsh, 1973: 91). Rinearson began managing the Mt. LeConte Lodge.